At Park Dental of Colmar, we share your goals for sustaining your child’s oral health. Helping them learn good routines from the beginning creates a lifetime foundation of strong dental habits. From a young age, many factors contribute to your child’s teeth being very susceptible to cavities. 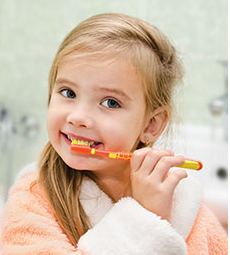 Children don’t have the required coordination to brush properly on their own. Because of this, it is critical for parents to help in their child’s daily hygiene. This promotes both thorough cleaning and the development of proper dental habits. Poor cleaning means teeth are more at risk to develop decay when subjected to food and juice acids. Little kids often “graze” – eating frequently throughout the day. This results in a protracted exposure to food acids, which may result in more cavities. The good news is that recognizing inadequate dietary and hygiene habits, along with applying a fluoride varnish to the mineralizing teeth, can drastically reduce the odds of your child incurring a cavity.